Listen to the whispers - they're all over town. People have secrets, millions of secrets, and some of them are so explosive they could shift the balance of power in the Treaty City of Denver. Normally, the great dragon Ghostwalker's tight grip would keep the city under control, but some of the whispers moving around town say that Ghostwalker hasn't been himself lately. The powers of Denver are scrambling, the Treaty is about to be renegotiated, and information is the hottest commodity in town. Spy Games brings Shadowrun players to the espionage-filled city of Denver, where secrets are bought and sold, and sometimes the price is paid in blood. Accessing these secrets may mean using cutting-edge surveillance gear or powerful magic, or it could mean turning back the clock and breaking out low-tech cloak-and-dagger approaches that the techheads of the world would never expect. 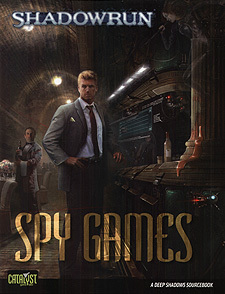 Spy Games provides setting information, gear statistics, and game rules players need to dive into Sixth World spycraft.